It's your special day. And you want everything to reflect you - your style, your likes, your colours. And whether you like traditional, romantic, modern or funky we can design and create your perfect wedding flowers, something as individual as you. With so many flowers available, choosing floral designs for your wedding can be overwhelming. Our team of friendly, experienced florists will work with you to make your floral ideas come to life. The best time to come for your first consultation is once you have chosen your wedding dress and have some idea of the colour scheme you would like. Bring with you swatches of any materials you are thinking of using, especially for bridesmaids dresses. Thinking about flower types and colours at this stage makes it easier to have an integrated colour and design style. There are various bouquet shapes – round, sheaf, tear drop, trailing - and each can be created with many variations so please bring pictures of any bouquets you love as this will help us understand your style and preferences. And we have our own photo album for you to look through as well. 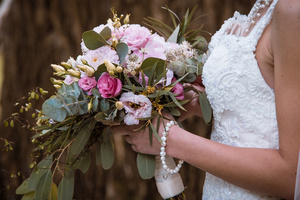 Visual references really help when it comes to choosing design details – the size of your bouquet, amount and type of foliage, pearls, diamanté and other decorative materials, and the design of your bouquets binding. Love is in the details. We also create the full range of wedding flowers - buttonholes, corsages, flowers for the littlest of flower girls, hair flowers, pew ends, large arrangements for church or venue, table arrangements, and cake toppers. Everyone has a budget whether modest or lavish and we are used to working with them all. We grow many of the flowers that we use in our own nursery in Mosgiel ensuring the freshest flowers possible. As florists and growers we love fresh flowers. Not everyone is able to have fresh flowers at their wedding. But all brides deserve beautiful flowers so we are happy to create beautiful, artificial bouquets and arrangements too. We love flowers and enjoy working with them. We're friendly, approachable, professional, knowledgeable and here for you and your wedding. Mary and The Greenhouse girls.